“Once upon a midnight dreary, while I pondered, weak and weary over many a quaint and curious manual of forgotten games…”. I actually have no idea where I’m going with this. All I know is, no matter how creative I think I am, quoting – or maybe quothing – Poe in the introduction to a game review, for this game, it has been done before. And it will be done again. But please, gentle reader, don’t hold my lack of creativity in starting this review against me. After all, how often do I get a chance to quote Edgar Allan Poe in a game review and be both thematically and stylistically fitting? So, what we have today is a game about crows. That’s not entirely the same as ravens, but the relationship is close enough to warrant the quote. And if you don’t believe me, don’t take my word for it. One Stephen Conway thought the same thing when he created the amazing, Poe-themes stop-motion animation explaining the game . The animation, incidentally, that Valley Games were showing at their booth in Essen and that had at least some small influence on our decision to acquire Crows. We showed the animation here before, but just in case you missed it, here you have it again. So, Crows is a game about attracting crows. Why you’d want to attract them is not really explained, but the more important part is where and how you attract them, anyway. 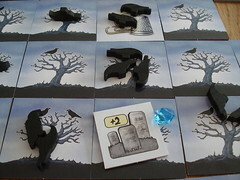 You play in a gloomy looking landscape created from tiles – think cemetery Carcassone – in fall, at night, by full moon and go around baiting the birds. The area is dominated by bare-branched trees and punctuated by the occasional graveyard. Exactly the kind of place to go for a walk around midnight, just don’t forget your garlic at home. The illustrations convey this atmosphere astonishingly well, considering that basically there is only one kind of tree and one kind of graveyard on the tiles. In the beginning, nine tiles are arranged in a diamond pattern on the table, with each tile touching others only by the corners, leaving four gaps. All the tree tiles are populated by as many creeple as there is crows in the tree, from none to three. Regular readers will have figured out already that creeple is the neologism for crow meeple – finally there was a chance to fulfil my contract again and use a word created from meeple. Anyway, those wooden creeple – in two different poses, all black, and all adorable – is what we’re trying to attract here. Crows is very easy to understand and plays very quickly. If no one over-thinks their move, it rarely takes longer than 20 to 30 seconds, because what you do is: draw a tile, place it, place your shiny object somewhere. Placing a tile is as easy as it sounds: Your tile has to be horizontally or vertically adjacent to a tile that is already in play, since Crows is not, at heart, a tile-laying game you don’t even have to make the image on the tile match with the surroundings. If your tile was a tree with crows on it, place that number of creeple on it. Then put your shiny object on any free tile, not necessarily – or even usually – the one you just placed. You can not place your shiny on a tile that has creeple, or someone else’s shiny, or is just plain trash (see below), but other than that anything goes. If your location of choice is a tree with no crows printed on it, you may now draw a special token. 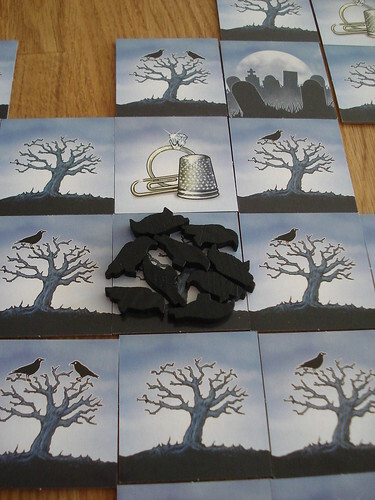 These special tokens can have a variety of effects: they can keep crows grounded on one square for a round, can move two crows to a completely different square, make all graveyards behave as normal tiles for this round or make one tile behave as a graveyard for this round – presumably, this is also handy when you really need to get to sacred ground. Before your turn ends, you can use one on these special tokens, or you keep them for extra points at the end of the game. Once all players placed a tile and their shiny, the crows start flying. This is the interesting part of the game, the part that decides if your shiny was well-placed or not. All crows move to the closest shiny, but only vertically or horizontally. Crows are very orderly creatures and would never take a diagonal route. Also, they will never cross gaps in the landscape, it’s a little-known fact that crows are very scared of black holes. If multiple shinies are at the same distance from a tile with crows, they will split up. Each shiny attracts the same amount of crows, left-over crows got confused and stay behind. Of course, everything would be different if one of the shinies was more shiny than the others. There is some tiles in the stack that show more shinyness instead of a boring old tree or graveyard. These tiles act as tie-breakers. If your shiny object is on one of them, all crows that are the same distance from your shiny and another player’s shiny will flock to you. Handy. Crows can and will fly any distance to reach the shiny objects, so quite often you get a long line of crows all assembling on someone’s colourful piece of glass.There is one option for less-than-friendly players to influence the crows flight: every player starts the game with one trash tile. Instead of drawing a tile and placing it, they can decide to place their trash tile. The trash tile replaces one tile in the landscape that is currently empty and can never have a shiny object on it. Trash itself does not attract the crows, but if they come across it on their way to a shiny, they will stop there. This way, you can stop a whole bunch of crows from reaching your opponents shiny. Crows that start on a trash til, however, fly normally. Once all the crows have flown, players receive points. Counting points is another thing that is very easy: when your shiny is on any tile but a graveyard, each crow there is worth one point. If your shiny is on a graveyard, each crow there is worth two. Remember the special tokens from two paragraphs ago? Now you realise that that other player did not have your best interest at heart when he negated the graveyard bonus for this round. Now there’s one more thing to do before the round is over. If all those crows stayed in the same place, it would be pretty boring, everyone would just place their shinies next to the biggest flock. That’s why every murder of six or more birds – honestly, it’s called a murder of crows, I’m not making this up – scatters: two creeple are removed from the game, one stays behind, the others follow a spiral outward with one crow staying on each tile until they are all scattered. If this brings another tile above the crowtical mass, the crows there do not scatter until after the next turn. The player who went second on this round goes first on the next, and the game proceeds till all the tiles are used up. As you can see, Crows uses very simple game mechanics. You place a tile, crows fly in a straight line, your points are the number of crows times one or times to. Nevertheless, the game is not in the least boring. The very quick turns keep everyone involved at all times, there is no waiting at all. The changing start player makes sure that the game is balanced – or at least that everyone complains equally about not being in a different position for this turn. There is no general advantage in going first or last in Crows, anyway. Going early means you get to pick the best position for your shiny, going late means you can react to where the others put their shiny and steal a few crows from them, not to mention the special tokens to mess with them. The way a murder of crows scatter is another very simple yet efficient solution to the problem that crows tend to concentrate on very few tiles. The pattern to place the scattering crows makes sure that they will go in different directions on the next turn because no one can attract them all with their shiny. There is only one thing in Crows I’m unsure about: the trash tile. While in theory it’s a great idea to block the crows from reaching an opponents shiny, I find it hard to use effectively since you need an empty tile between you and the other player’s shiny in order to place the trash there, and many times the shiny will be right next to the line of crows it’s meant to attract. And when I find a place to put the trash, it usually comes back to bite me on my next turn. Of course, this doesn’t make the trash tile a design flaw, I just get disappointed finishing a game without using mine. This one gripe aside, Crows is an amazingly fun game. It’s easy enough that new people are ready to start in less than ten minutes, light enough to play while talking about bad horror movies and engaging enough to keep everyone asking for just one more game. To give you an idea, Crows is the only game I remember that no one we tried it on disliked.